← My First Wine-Part 4: H2S and Why you Should Rack! Well, after having racked both carboys of wine several weeks ago, I thought it was about time I ran some labs on them. So I took some samples to school and ran SO2‘s, pH and TA (titratable acidity) tests, as well as doing a chromatography test on them. 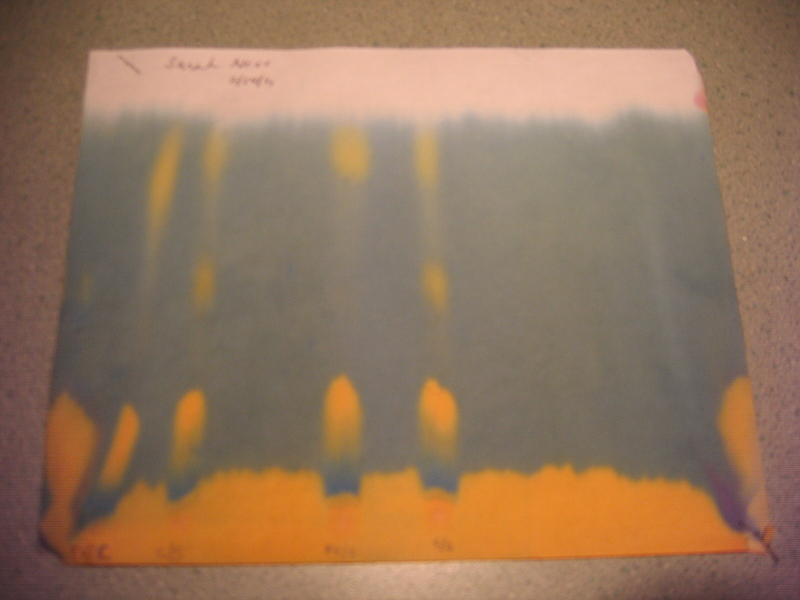 This test tells me whether the wines have converted malic acid to latic acid. Malic is a harder/sharper acid; think sour apple. Lactic acid is much softer. As I suspected from tasting as well as watching pH and TA’s go up and down, it looks like the Petite Verdot/Cabernet Sauvignon blend have almost completely converted to latic acid. The Sangiovese/Cabernet Sauvignon still have a way to go. After going through all the trouble of running an SO2 test on my wines, I realized that I had used the wrong strength of NaOH, so I’m still not sure how much free SO2 is present. So I decided I will run them again once they are through with malic/latic conversion. I won’t want to add any now anyway, since that would stop the conversion process. Posted on February 18, 2011, in My First Wine series, NW Wine Academy, Uncategorized and tagged Acids in wine, Beverages, Cabernet Sauvignon, Drink, Food, Malic acid, Malolactic fermentation, PH, United States, wine, Wine tasting descriptors. Bookmark the permalink. Leave a comment.